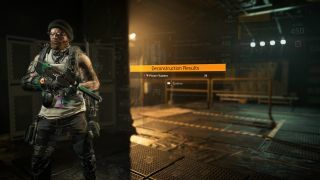 Getting printer filaments to upgrade your crafting bench is easy in The Division 2—our guide will talk you through it. Printer filaments are one of the many types of crafting material found in The Division 2. They don’t do much at first, but by the time you’re in the endgame they become vital, as they’re a required material for upgrading your crafting bench to make stronger equipment. Unlike most other materials, though, they’re really easy to miss if you don’t know what you’re looking for. Printer filaments don’t drop from enemies like ceramics, polycarbonate or steel. Instead, you get them by deconstructing mods. Any sort will do, and chances are you’ll have picked up more than a few of them completing missions or pottering around DC, as they’re a very common drop. Once you’ve got a few, deconstruct them and et voila! Printer filaments. Before rushing to deconstruct all your mods, there are a few things to consider. To maximise the amount of printer filaments you can get, unlock at least the first tier of the Deconstruction perk from Coop Dennison at the White House. This will increase the amount of a mod can yield when deconstructed. Despite the name, maxing out the Crafting Materials perk isn’t necessary (although it’s still helpful for all the other stuff you’ll need), and the cap will stay at 100 even when you get to the third tier. Pick which mods you harvest carefully. While it might be tempting to simply deconstruct any mod that isn’t high-tier (yellow), make sure you’ve thought about the benefits they might have to your character build. Lower quality skill mods tend to have buffs that are more easily activated and can still be great improvements to your character. High-tier ones are more powerful, but their skill power requirements can be much higher to reflect that. As a rule of thumb, make sure you’ve fully modded all your gear and active skills before harvesting your mod inventory for printer filaments. Mods for skills you’re never likely to use are a safe source, as are gear system and gear protocol mods that augment those skills. Skill mods that are higher than your current skill power can also safely be deconstructed for printer filaments too, as they won’t provide any other benefit to you in the immediate future. It’s tempting to hold on to any mod you think might be helpful at some point, but upgrading your crafting bench using printer filaments is a good investment. A better bench means you can craft better gear, which increases your gear score and, ultimately, allows better mods to drop. Printer filaments are one of the easiest crafting materials to acquire, it just takes a little bit of planning and consideration, and the benefits are huge.